In the frontal test, the passenger compartment remained stable. However, there was insufficient pressure in the driver's airbag to prevent the head from making contact, through the fabric of the airbag, with the rim of the steering wheel. The car was penalised for this 'bottoming out' of the airbag. Cars from VIN VF1LZBZ0L46468288 are equipped with a modified driver airbag. Euro NCAP has tested a car with the updated airbag and the driver’s head did not ‘bottom out’ in that test. Structures in the dashboard were thought to present a hazard to the knees and femurs of the driver and passenger. In the side barrier test, protection of the chest was adequate and that of other body regions was good. In the more severe side pole test, dummy readings of rib deflection indicated weak protection of the chest. The seat and head restraint provided marginal protection against whiplash injuries in the event of a rear-end collision. The car was checked after all of the tests and no electrical hazards were found. 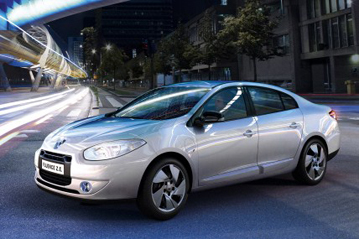 Based on dummy readings in the crash tests, the Fluence ZE scored maximum points for its protection of the 3 year dummy. Forward movement of that dummy, sat in a forward facing restraint, was not excessive and, in the side impact, both dummies were properly contained by the shells of their restraints, minimising the likelihood of dangerous head contact. The passenger airbag can be disabled by means of a switch, allowing a rearward facing restraint to be used in that seating position. However, information provided to the driver regarding the status of the airbag is not sufficiently clear. However, clear information is provided in the car regarding the dangers of using a rearward facing restraint without first disabling the airbag. The bonnet provided predominantly poor protection in those areas likely to be struck by the head of a child or an adult. The front edge of the bonnet was also predominantly poor in its protection of a pedestrian's upper legs and pelvis. The bumper offered good protection to pedestrians' legs, and scored maximum points. Electronic stability control is standard equipment and met Euro NCAP's test requirements. A seatbelt reminder is standard for the driver and passenger seats. A driver-set speed limitation device is optional on some variants but is expected to be fitted as standard in sufficient numbers to meet Euro NCAP's 2011 fitment requirements.